Last Update: August 25 2013.
was sequenced by Barry Taylor. Yankee Doodle WAV file is from Mattatuck Drum Corps recording. This Web Site has been serving the Fife & Drum Community Since January 29, 1996 .
has been serving the Fife & Drum Community since 1996. Thomas Riemer, 63 of Clinton born in Bristol, CT on September 26, 1949, passed away peacefully on Tuesday, March 19 at Gladeview Rehab Center in Old Saybrook. Tom had been in poor health for several years, but continued to have a positive spirit and to be a friend to all who needed one right to the end. 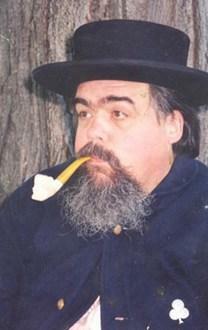 Tom was a life-long student of history, with a special interest in The Civil War. Tom, along with his cousin and close friend, Mark Riemer, spent years studying clothing, black powder, weapons and accoutrements, fabric etc., so they were as authentic as possible in their representation and the perpetuation of living history. Tom was a camp commander of Alden Skinner Camp # 45 located at the GAR Hall in Rockville, CT from 1988 to 1993. He did much in helping develop Camp # 45 in becoming one of the most active ones to date. Tom's life-long love of music lead him down many various avenues of expression, including drumming and singing in rock bands, minstrel music and rudimental bass drumming which he excelled at. He leaves behind many life-long friends, including his Connecticut Yanks, Fife and Drum Corps, "brothers and sisters", as well as the many entertaining stories he used to tell. Tom leaves behind his beloved wife, JoAnn (Brodeur) Riemer, two daughters, Elizabeth and Erin Heald and his grandson, Lindsey and granddaughter Olivia, both whom he adored. He also leaves a brother, Fredrick Riemer and a sister Kathy Riemer along with his devoted niece, Shannon Tardiff, whom was alongside him at the time of Tom's passing. Tom was predeceased by his parents, Carleton Riemer and Marguarite Donahue Riemer. Tom lived his life well, straight and true and he will not be forgotten. A memorial service/celebration for Tom will be held on Sat. April 6th at 1pm and the Eulogy will be at 3pm. This will be held at the Riemer home, 21 Elmwood Way, Clinton, CT 06413. I wish to express my deepest condolences to JoAnn and the rest of my friends in the Buxton Corps. Tommy was one of my dearest friends. I will play back the video I made of the little "story" he told us during the Drummer's Call last fall in Old Strubridge Village ... ..... .... many, many, times in remembrance of a happier day. VIDEOS!! From Way back when!!! The following videos are through the courtesy of George Carteris. 1990 From the Fairfield Memorial Day "gazebo" concert. This one is the Chanteymen singing. 1994 Deep River Ancient Muster. It’s The Ancient Mariners' on-stand performance of UnionJack. It was dedicated to Norm Ott who you’ll clearly see in the video along with several other Mariners now on the Oar. Wanna See me Drumming??? ! In this first clip, I play The Long March or Open Beating Number 4 from the Massachusetts Collection, followed by Open Beating Number 3 and Open Beating Number 2. The Connecticut Half-Time, An Irish Lilt, (original composition), The Rudimenter by Earl Sturtze, The Downfall of Paris (with a horse-fly attack! ), The Army 2/4 with the fillers, Crazy Army 2/4 with the fillers by Ed Lemley, Billy Budd by Eddie Classey, Some original stuff ripped off the top of my head on the fly, The Happy Fifer by Eddie Classie, and Ol'Dan Tucker (all THREE parts).. I will run these slideshows from now on. Use the "BACK" & "NEXT" buttons to navigate. Content WILL change throughout the year, so check back often! They may or may NOT be "muted" whenever I have a death notice posted. Images & reflections collected in the weeks after the attacks on the World Trade Center, NYC. Preserved here as a tribute to all who lost their lives that day and in honor of those who worked so hard trying to save more lives. The 2018 Deep River Ancient Muster ! The 2017 Nathan Hale Ancient Fife & Drum Muster ! The 2017 Westbrook Muster ! To find out what ELSE is happening while you are enduring, click HERE and check Schedule of Events. forgave other billions in debts. None of these countries is today paying even the interest on its remaining debts to the United States. The Marshall Plan and the Truman Policy pumped billions of dollars! into discouraged countries. Now newspapers in those countries are writing about the decadent, war mongering Americans. I'd like to see just one of those countries that is gloating over the erosion of the United States dollar build its own airplane. If so, why don't they fly them? Why do all the International lines except Russia fly American Planes? putting a man or woman on the moon? but several times - and safely home again. When the railways of France, Germany and India were breaking down through age, it was the Americans who rebuilt them. When the Pennsylvania Railroad and the New York Central went broke, nobody loaned them an old caboose. Our neighbors have faced it alone, and I'm one Canadian who is damned tired of hearing them get kicked around. They will come out of this thing with their flag high. And when they do, they are entitled to thumb their nose at the lands that are gloating over their present troubles. I hope Canada is not one of those." every person on the web. I am just a single American that has read this. The Fifing Rabbit's Band has learned a new tune! And just for you people who happen to like CATS!, PRESS HERE. And for those of you who HATE cats, Press HERE. by e-mail whenever this page is updated. An area dedicated to remembering. This Photo was taken in Novemeber 1993 at my home. This prayer was written for The Company in January, 1967 by Father Kenneth H. Kinner, Chaplain Emeritus. In addition to being respected for his devotion to his vocation, Fr. Kinner is also admired by his friends in the fife and drum world for his ability to play the snare drum. we ask Your protection for fifers and drummers throughout the land and the hope of your Divine Providence for all men. Amen. "those who have marched before us". maintained on this site as a permanent tribute. He did do much to give us "The Book(s)"
Co-forgers of the Links between the Swiss & American Fife & Drums Corps! These men passed from us within two weeks of each other! Freddi on March 29, 2003 and Alfons on April 13, 2003. Founder of the Westbrook Muster. died Monday, August 9th 1999. Truly, "A Man You Don't Meet Everyday." died Saturday, December 21st 2002. A true friend to the Fife & Drum Community ! died Saturday morning May 30th, 1998, from injuries sustained in a recent automobile accident. Jack will be well remembered by all who knew him. 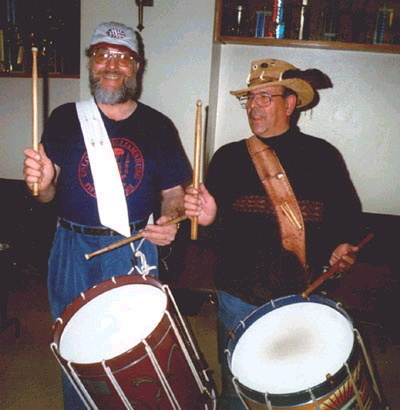 Olde Ripton Ancient Fife and Drum Corps. Drop in and say "Hello!"